Let me teach you guys a magic trick. How’d you like to learn how to take some old cans in your pantry and elevate the contents to heavenly bites of goodness? 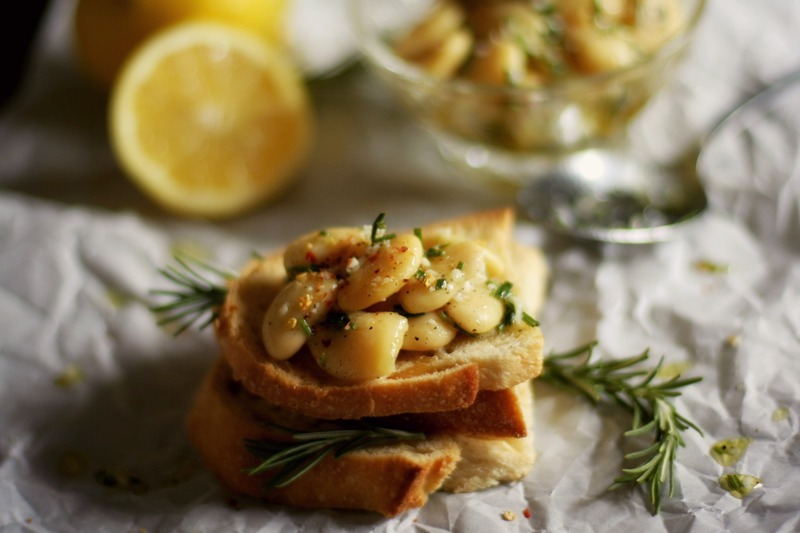 This white bean bruschetta is downright dirty in its simplicity – crack open a can of white beans, toss with a fresh vinaigrette of lemon, rosemary and garlic, and slather the deliciousness on toasted crostini. Because you are spending practically no time crafting this one, it lends itself perfectly to a more complicated menu where you want to save some precious minutes in the kitchen. Or for when you want to gnaw your own damn hand off in sheer hunger. You know, those times that you’re cooking dinner and you need to eat before you eat lest you fall out in front of the stove? You can cop to it – this is a judgement-free zone. Because the beans are canned, you’ll need the freshest lemon juice, rosemary and garlic to get the job done. Skimp on quality and you’ll be none the wiser. Preheat the oven to 400°. Line the slices of baguette on a cookie sheet and brush with olive oil on both sides. Bake until crusty and gorgeous, about 10-12 minutes. While the toasts are doing their thang, prep your beans. Toss the white beans with the chopped rosemary, garlic, lemon, olive oil, salt and black pepper. Taste for seasoning. Check your email. Eat some more of the beans – you know, just to make sure that the seasoning is right. Taste again. Go on, I won’t tell. Before all the beans are gone, take your bread out of the oven. Top the slices with the white bean mixture, sprinkle with a little crushed red pepper (if you like it hot) and then drizzle with the extra lemony marinade. Eat the rest like a damned golden god(dess). You are awesome!! Love this!! Adding to my bruschetta collection!! 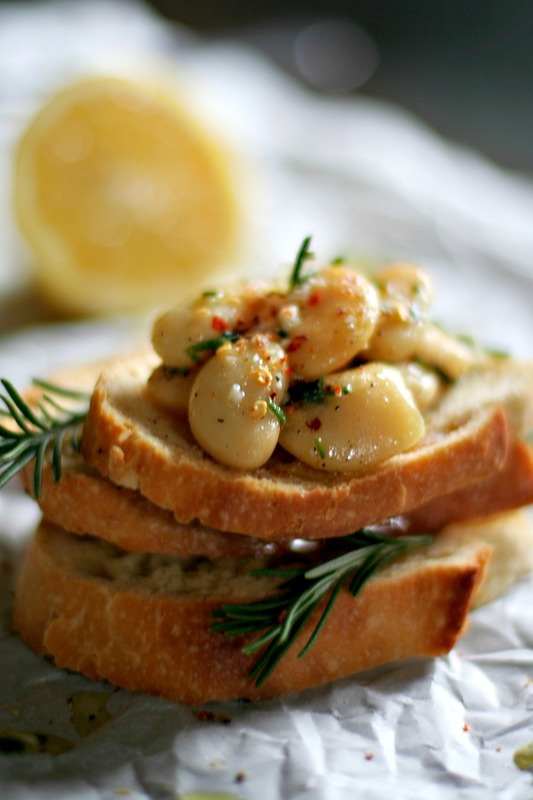 What is it about white beans, garlic and rosemary? That is just a perfect combination of flavors! Never would have thought to put them on a slice of bread. Love this bruschetta!! For real! Those three ingredients play nice together in hot or cold dishes like they were meant to be together. Bread works, but so do crackers. And you could take the whole thing for a spin in the food processor with a little extra olive oil for a white bean hummus, perfect for scooping up with pita triangles or baby carrots. The majesty is endless. With a recipe this simple, you couldn’t be any closer to snack nirvana.